Real estate agents across SW Florida have been complaining that sales have been sluggish, however the numbers show that 2018 Lee County Florida home sales shaping up to be decent year. Both April and May numbers have topped previous years, and January, February, and March are right in there. If things keep progressing, we’ll have a chance to top 2015 sales levels. What is fueling the increase in home sales? Two things come to mind right off the bat. Higher inventory and price reductions. Inventory 7.8% this year to 5,787 listings compared to 5,368 last year. This opens up more choices for buyers. We’re seeing as many price reductions as new listings in a typical 7-day period. 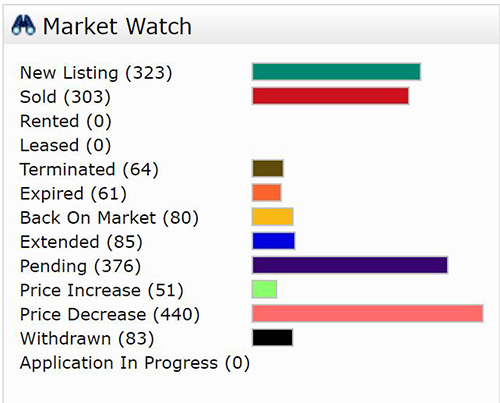 In the past 7 days we saw 440 price reductions compared to 323 new listings and 376 pending sales. This tells us sellers have recognized the need to adjust their price and are making the adjustments. When this happens, sales occur. 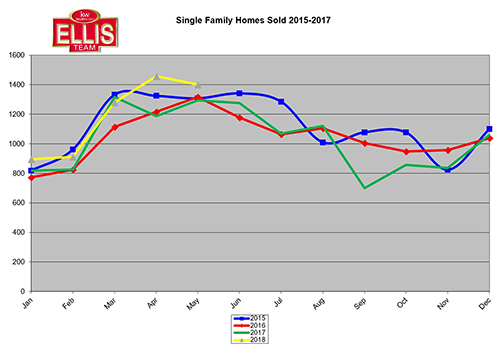 Official numbers released this week show median price and sales price increasing in May. You might ask, how is it possible to have increasing prices while sellers are decreasing their asking prices? Median price is defined as the price where half the sales occur over that price and half occur under. If most of the upper end sellers overprice their home, there are fewer sales up there and it forces the median price down, because that’s what’s selling. Lower priced sellers were more in-tune with the market. As the mid and upper ranges accepted that change needed to occur, more sales started happening. As this occurs, it pulls the average and median price upward. Many will read the headlines and infer that prices are rising when in fact prices have not been rising. It’s the fall in prices that created the sales. It is the reluctance of mid to upper sellers to adjust sooner that stalled the sales. There were only so many mid to lower listings to go around. We expect to see good sales numbers the balance of 2018 as the market adjusts to the shift. The market always adjusts. It’s only a matter of how long it takes to do so. It’s kind of like pulling off a band-aid. You can pull it slowly or rip it off. Either way it comes off, it’s just a matter of how long you want the pain to last. Buyers can rejoice now because there are some pretty good deals out there. For instance, we’ve got a 5-bedroom, 3 bath pool home on the lake in Reflection Lakes for just $459,000. Last year that same home would have sold for $525,000. We’ve got a 4-bedroom 3 bath home in Belle Lago for $465,000. It was on the market with another broker last year for well over $500,000. Imagine getting a 4-bedroom home in Paseo for $500,000. We’ve got that too. We even have a 4 bedroom home in Reflection Lakes for $375,000. In fact, if you want to see a list of Hot Buys, go to www.LeeCountyOnline.com and click on the Featured Listing Section. If you’re interested in how a neighborhood is doing, check out the Market Reports section. Sellers who are curious as to their home’s value will appreciate the property valuation tool. It’s free, and provides a detailed report on your home within seconds. If you’re thinking of buying or selling, we should probably talk. We’ve got a way for you to save thousands when getting a mortgage. We have options for you to save thousands too when selling. If you’re thinking of selling, ask for Sande or Brett Ellis 239-489-4042 Ext 4. If you’re buying, we have a team of buyer agents ready to help you find your dream home and save money on the loan too. Always Call the Ellis team! We’re here to help. Posted in Cape Coral Real Estate, Fort Myers, Fort Myers Beach, Fort Myers Real Estate, Open House, Reflection Lakes, Southwest Florida Real Estate.